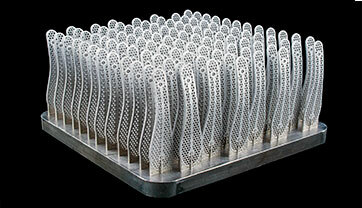 Think Additive Manufacturing is too expensive to invest in? Think again . 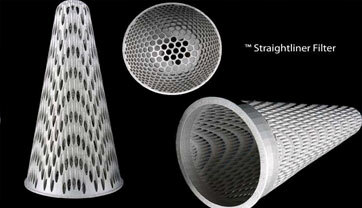 . .
We specialise in the Additive Manufacture (3D Printing) of complex metal components. AM Design freedoms enable components to be designed and built to add value such as improved performance, light weighting, multi-part to single part, low volume production runs, prototyping, reverse engineering and supply chain value. 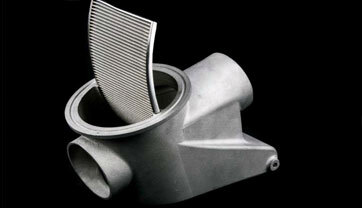 At Croft Additive Manufacturing Ltd our aim is to supply industrial Additive Manufactured components to our customers, helping them to fully utilise the technology to suit their individual needs and to solve their unique problems, working as a team, we deliver high quality products and service. Benefits of the Additive process, such as: Part weight reduction, Multi-part to single component and Expanded design capabilities, allow our customers to re-think their approach to their designs in order to improve the efficiency, utility or aesthetics of their parts. Supported by more than 30 years of engineering experience through Croft’s sister company Croft Filters Ltd, we are committed to supplying AM parts of the highest quality, and also sharing knowledge of the AM process to support potential users in their adoption of this technology. Layer by layer manufacture of components delivers design freedoms to create components that cannot be manufactured conventionally, adding value through improved function, decrease in part number, light weighting and innovation in design where not possible previously. Additive has these benefits and more. All components are designed with the subsequent manufacturing processes in mind. Design for AM (DfAM) is different from that for conventional manufacturing processes. Multi-part to single part design will decrease your supply chain costs. We can advise on design features for AM to optimise your design for AM. Low volume production of single parts or multiple parts can deliver value into your supply chain. Parts can be produced in batches relevant to your requirements over an agreed time period. A price reduction by having less tooling costs is an additional benefit to the production run using additive manufacturing. If you have any questions you would like to ask of find out more about what we do please fill in the form below and someone will get back to you promptly.